Flowers! Flowers! Flowers! 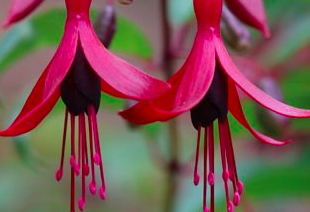 This extraordinary hardy garden Fuchsia produces masses upon masses of long tubular flowers. The floral tube and sepals are white and corolla is deep rose with distinct orange tints. To 2.5′ tall and as wide in a single season. Heavy bloom begins almost immediately and continues unabated to frost. 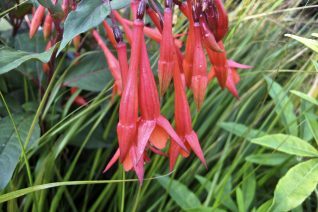 Excellent container Fuchsia and in the garden give it rich soil that is moisture retentive but drains. Incorporate plenty of compost into the soil and add a handful of all organic fertilizer at planting. Mulch the first winter and plant deeply to protect the crown. Once established it is reliably hardy. Freezes to the ground below 26ºF. Returns in mid-spring from the base and almost immediately starts blooming. Regular summer water. Full sun to part shade. (Avoid the reflected heat of a wall). Excellent performance on open north exposures where there is bright light but protection from intense heat/sun. 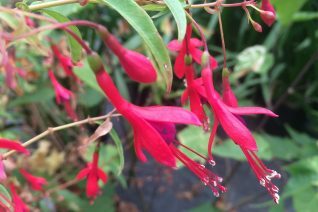 Excellent hardy Fuchsia with very pretty flowers. 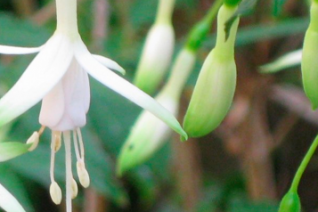 The sepals are white with a bit of green on the tips. The corolla emerges purple/blue and fades slightly to violet. 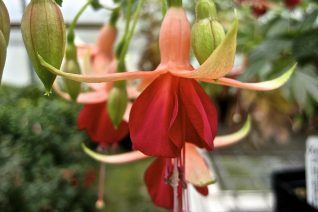 Upon opening the sepals slowly open and then gracefully recurve over the top of the flower. It reminds me of origami. Very upright growing plant to 2.5′ tall and just 18″ wide in a season. Constant bloomer from June to frost and beyond. Freezes to the ground below 26ºF and returns vigorously from the base in spring. Plant deeply for extra winter protection for the first season. Mulch with compost in autumn. 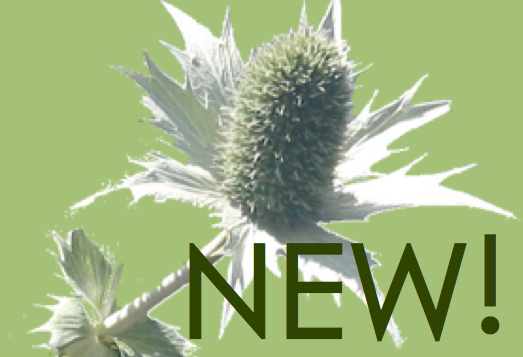 Add a handful of all organic fertilizer in spring. Regular summer water in full sun to part shade to quite a bit of shade. 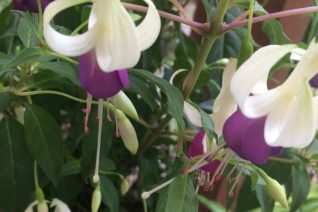 Easy garden Fuchsia with lovely flowers. Hummingbirds, bumblebees, be-sotted gardeners, big containers. 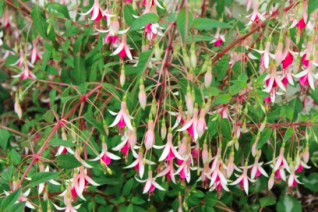 Adorable Fuchsia that is a prolific bloomer. Widely spreading diagonal stems support curtains of pendant small flowers. The sepals and floral tube are white and the corolla is violet purple. Each flower provides its own contrast but in masses they are beautiful. To 2′ x 3′ in a single season in rich, moisture retentive soil with good drainage. Regular summer water. Apply a handful of all organic fertilizer in mid-spring. Dies to the ground in the first hard freeze, resprouts from the base in mid-spring. 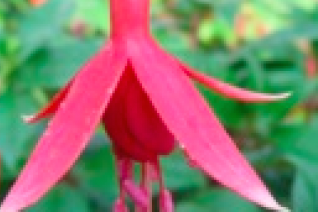 Great container Fuchsia. Apply a thick mulch of compost for the first autumn and plant deeply for added winter protection. 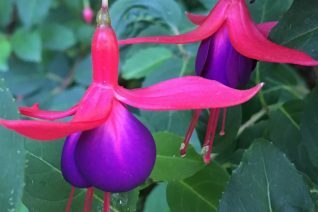 Regal, rambunctious and totally hardy climbing Fuchsia species with handsome long glossy green leaves and masses of small glossy red and purple tilted flowers on long stems. To 8′ tall in a single season it is one of the cold hardiest of the genus and wood is seldom frozen back all the way to the ground. its hardiness ensure early growth and subsequent bloom. Full sun to quite a bit of shade in rich, well drained soil with light, consistent summer irrigation. Though it will subsist on less. Long lived large plant that can increase by suckering as well as top growth. The vivid glossy flowers are tilted outwards beckoning nectar seeking animals. 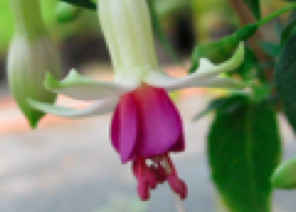 Wood is hardy to 15ºF- the hardiest of any Fuchsia that we grow. Give it room and support. May be grown as a free standing shrub.